Golf – As a guest of the resort, you are next door to Puerto Aventuras Golf Club, and you are not far from some other excellent golf courses such as the Playacar Golf Club. There are also great courses in Cancun toward the north, and southward to Playa del Carmen. Some of the courses are available throughout the state of Quintana Roo are Playacar Golf Club, Puerto Aventuras, Pok Ta Pok, Cozumel Country Club, Melia Cancun Golf Club, and Cancun Oasis Golf Club. The stunning scenery and beauty of these courses are on par with some of Mexico’s top courses. Pools – Seven outdoor pools are onsite. 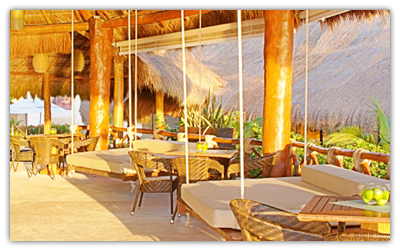 Comfortable lounge chairs and towels are provided all throughout the pool areas and beach areas by the beach butlers. Beach – The beach is gorgeous, white sand, and clean, perfect for snorkeling and swimming, with gentle surf and warm waters. 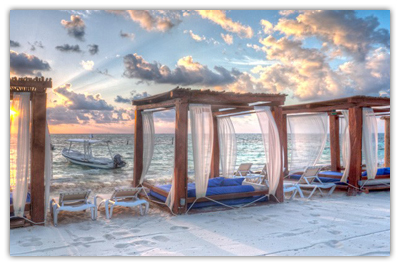 Enjoy sunbathing, shading under the beach palapas, anything you wish on the fine-grain white sand. Beach Butlers at the resort provide the ultimate in service and sun bathing convenience, including soft towel service, refreshment deliveries, tanning products, and water vaporizers. 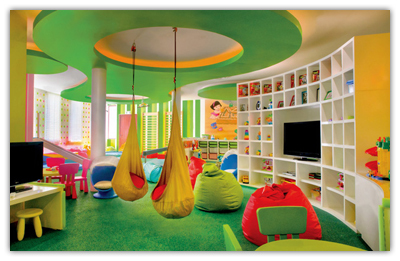 Kids Club – The Azulitos Play House is designed for children 4 – 12 years old. Activities include building sandcastles, balloon wars, face painting, singing, story telling, mini-yoga, handcrafts, movie time, treasure hunt, and more. The Azulitos Play House is open daily from 9:00am – 5:00pm and 7:30pm – 9:00pm. Children under 4 are welcome to participate with a parent or paid baysitter present. Diving and Snorkeling – Snorkeling close to the resort is excellent, or you can catch the nearby ferry to Cozumel. The coastal waters of Cozumel have superb visibility, and the seafloor is full of colorful coral and many species of marine life. Dive masters allow you and other scuba divers to choose your reef, depending on your experience level. Novices will enjoy Paradise Reef for the many shallow patch reefs, large brain coral, sea fans and sponges. Intermediate divers may try Palancar Caves or Columbia Wall and encounter big grouper, playful green moray eels, eagle rays, and turtles. For the very experienced, Maracaibo Deep and Barracuda Reef are riveting, where giant orange elephant ear sponges, black coral, large schools of fish, turtles, rays, and even hammerhead sharks may be spotted. Water Sports – This area is great for water sports. Sailing and parasailing, all types of motorized and non-motorized sports are available here. The Puerto Morelos marina is not far away. Non-motorized water sports such as kayaks, boogie boards and hobie cats are included with your Gourmet Inclusive package. Spa – Relax and unwind at the Vassa Spa by Karisma. Enjoy indoor treatment rooms or listen to the gentle waves as you indulge in a massage in the ocean gazebo. Treatments include massages, facials, hydrotherapy, and body treatments. The beauty salon offers a variety of services including hair cuts and styling, manicures, pedicures, and waxing. The spa is open daily from 8:00am – 7:00pm. Appointments should be made in advance. Fitness Center – Free unlimited use of the fitness center with all the latest equipment. The fitness center is open daily from 7:00am – 10:00pm. Shopping – There is a small gift shop at the resort. Enjoy a complete shopping experience when you visit nearby Cancun, Puerto Morelos, and Playa del Carmen. Playa del Carmen’s Quintana Avenida (5th Avenue) is the main shopping street, open exclusively to pedestrians. There are beautiful art galleries featuring works from artists throughout Mexico, handcrafts from all over the country, including jewelry, silver, furniture, clothing, shoes, and much more. Whether you’re looking for books, pewter, furniture, ceramics, original art, paintings, clothing and swimwear, Mexican handicrafts, hammocks, gifts and souvenirs, leather products, or something completely one-of-a-kind, you’ll find it. Weddings – The resort accommodate weddings, honeymoons, and anniversaries. A personal wedding coordinator will take care of all your details, from ceremony, judge or minister, paperwork, blood tests, decoration, menu, cake, photographer, and flowers. Exploration and Sight Seeing – The resort is in a great location with the natural aquarium of Xel-Ha, Eco park Xcaret, and Tulum, and next door to the Puerto Aventuras Golf Club. There are also many cenotes for diving throughout this region. Entertainment – During the day there are many things to do. The daily entertainment program includes Spanish lessons, yoga, aqua aerobics, dance, cooking classes and tequila tasting. Beachfront activities change daily and include activities such as the fish market, a beach barbeque, burger boutique, taco party, and more. Enjoy live music and shows nightly at the resort. Marina – The Puerto Morelos Marina has a waterfront stores and a disco. Check out the 250-yacht marina, Puerto Aventura’s deep water marina where you can dock cruising boats, sports fishermen vessels, or large yachts.